Each Isonas IP reader attaches directly to the network and is powered using PoE. This modular IP based door control system allows you to add one door at a time. The expensive control panel is no longer required! 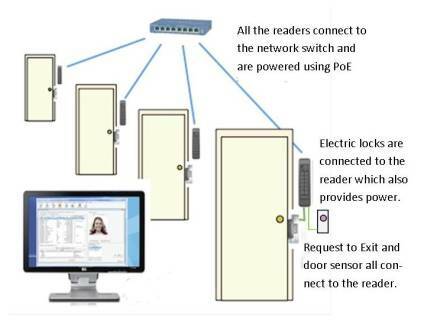 The ISONAS IP Door Access Controller and Reader includes all the functionality that used to be distributed between the reader and control panel. Now it?s all in one unit. With intelligence built into each and every unit, it operates even if your network is down. This IP based system integrates with your IP camera surveillance system to provide a complete security system that controls door entry using a credential or manually by using intercoms with video management software. The readers have all the intelligence built in so even if the network is down the reader keeps working. Of course it?s best to use a UPS on the network switch or the midspan that?s providing the PoE.